Tsubaki Grand Shrine (椿大神社, Tsubaki Ōkami Yashiro) is a Shinto shrine in Suzuka, Mie Prefecture, Japan. 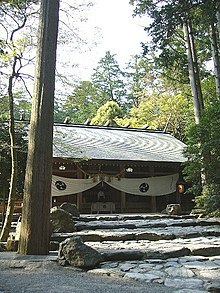 Tsubaki is the principal shrine of the deity Sarutahiko-no-Ōkami and one of Japan's oldest shrines. According to the shrine's records, it was founded in the year 3 BCE. 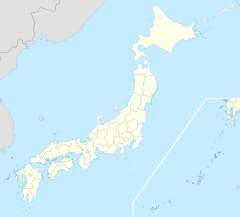 Other deities enshrined include Ame-no-Uzume-no-Mikoto, the wife of Sarutahiko who was supposed to have performed a dance which brought Amaterasu the Sun Goddess out of hiding in a cave, and Ninigi-no-Mikoto, grandson of the Sun Goddess and the mythical first ruler of the nation. As Sarutahiko-no-Ōkami is also revered in Aikido, Tsubaki has a martial arts hall for practice, as well as an archery range for the practitioners of Kyudo. There is also a chashitsu (teahouse) called Reisho-an, donated by the founder of Panasonic, Matsushita Konosuke. Behind the main shrine hall is a sacred waterfall, Kinryu Myojin no Taki, where misogi is practiced. The shrine has been in the care of the Yamamoto family for 97 generations. The 95th generation guardian priest was Rev. Yukiteru Yamamoto, the 96th generation priest was Rev. Yukitaka Yamamoto, and the 97th generation priest is Rev. Yukiyasu Yamamoto. ^ "Tsubaki Grand Shrine". Retrieved 22 December 2017. ^ "Shinto Shrines: A Guide to the Sacred Sites of Japan's Ancient Religion". Retrieved 22 December 2017. This article about a Japanese religious building or structure is a stub. You can help Wikipedia by expanding it. This page was last edited on 12 October 2018, at 18:15 (UTC).